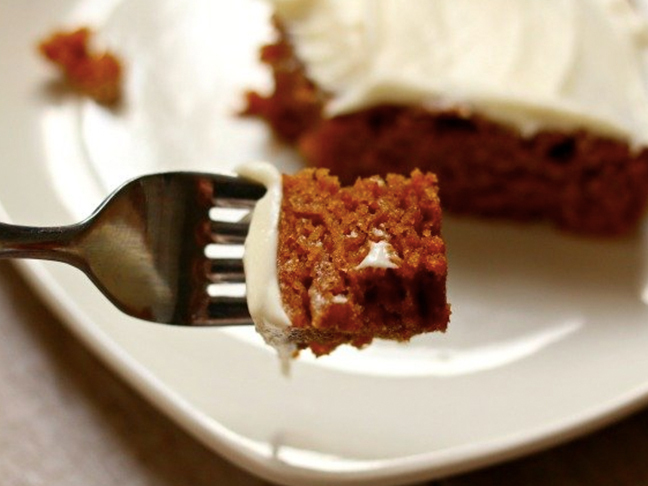 There’s no escaping the flavor of pumpkin for fall. The minute September hits we start seeing pumpkin cookies, pumpkin ice cream, pumpkin lattes, pumpkin breads and other random pumpkin products (um hello pumpkin Oreos) appear on the supermarket shelves. I even saw pumpkin M&Ms the other day. But even better than what you can buy at the store is what you can make in your kitchen. 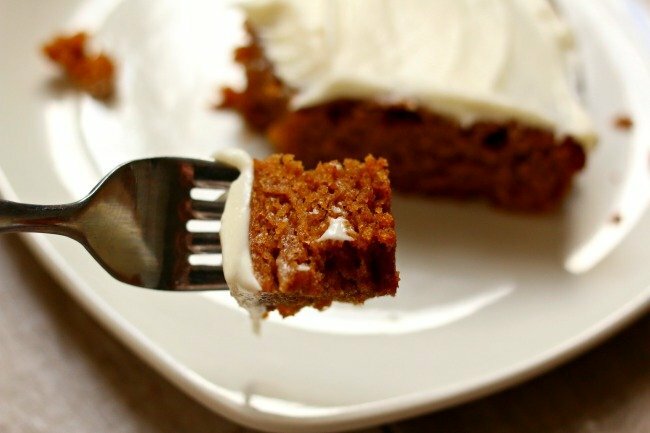 This easy slow cooker pumpkin cake is everything you need in a cake! It’s super moist and has just the right amount of spice. It is also blanketed in cream cheese frosting that makes you want to lick the plate. 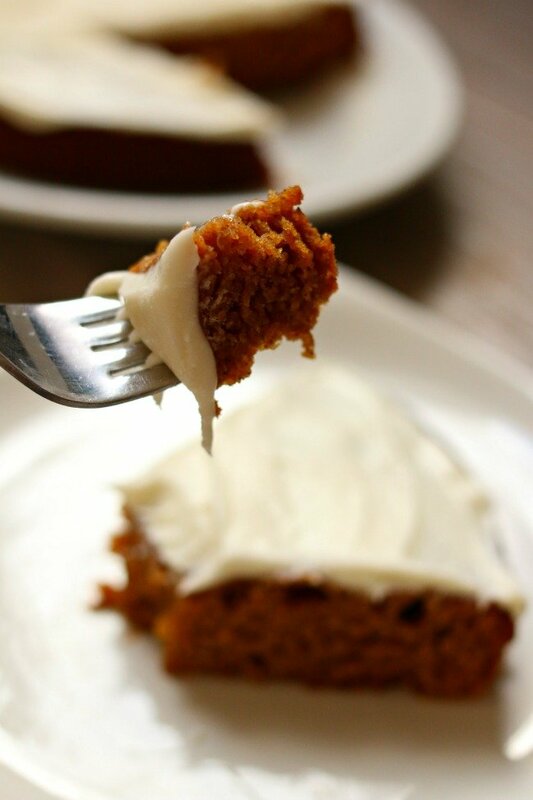 There’s not much I wouldn’t put this cream cheese frosting on! 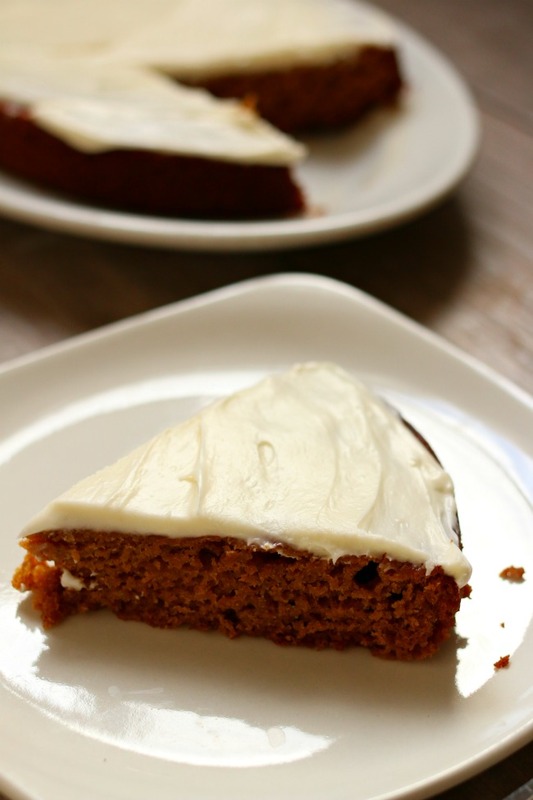 By cooking this cake in the slow cooker you really get a denser, moister cake. Plus you’ll have more wiggle room on the baking time. If you need to run an errand and the cake sits in there for an extra 10 minutes in the slow cooker it’s not going to burn or dry out like it would in the oven. I used a 6 quart oval slow cooker for this recipe. If you use a small slow cooker the cooking time would need to be increased and if you use a larger slow cooker the cake will cook quicker. Step 1: Place the insert of your 6 quart oval slow cooker on top of a piece of parchment paper (see above). 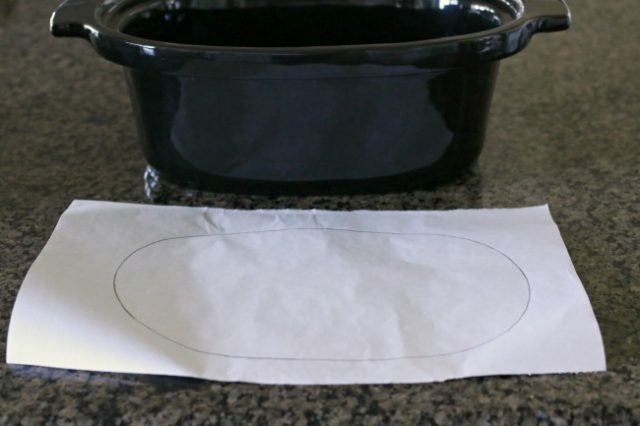 Use a pencil to draw an outline of the slow cooker insert. Cut the oval shape out and place it in the bottom of your slow cooker insert. This will prevent the cake from sticking to the bottom of the slow cooker. Spray the sides of the slow cooker with non-stick cooking spray. Step 2: In a large bowl whisk together the flour, baking powder, baking soda, salt, cinnamon and pumpkin pie spice. Step 3: In a separate bowl, whisk together the oil, eggs, brown sugar, white sugar, pumpkin and vanilla until smooth. Step 4: Blend the wet ingredients into the dry ingredients and whisk until smooth. Step 5: Pour the batter into the prepared slow cooker. Smooth the top with a rubber spatula. Step 6: Cover the slow cooker and cook on high for 80 minute to 2 hours (depending on your slow cooker). When you insert a toothpick into the middle of the cake it should come out clean or with just a few crumbs. Then turn off the slow cooker and let it sit for 30 minutes. Step 7: Gently run a sharp knife around the edges of the cake and invert over serving plate until cake drops out. Discard the parchment paper. Step 8: Prepare the frosting by using a mixer to mix the cream cheese, butter, caster sugar, vanilla and salt until smooth. Step 9: When cake has completely cooled spread the frosting over the tops and sides of the cake. Cut and serve.